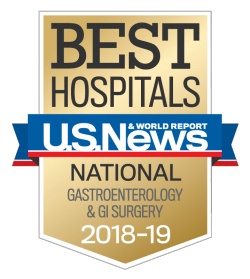 The Digestive Health Center at University of Colorado Hospital in metro Denver provides nationally-ranked GI and gastroenterology services to patients. Our association with the specialists and researchers at the CU School of Medicine means that we have access to the latest treatment options and diagnostic breakthroughs for digestive disorders. Our bariatric endoscopy experts bring collaborative care and the latest technologies to patients with obesity, complications from bariatric surgery, or weight regain after bariatric surgery. Our procedures are non-surgical, which enables patients to get back to their normal lives faster.